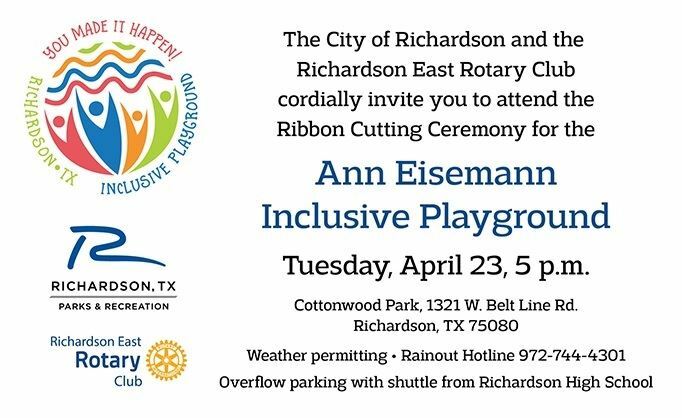 The City of Richardson and the Richardson East Rotary Club cordially invite you to attend the Ribbon Cutting Ceremony for the Ann Eisemann Inclusive Playground - named in honor of our very own Ann Eisemann! The ceremony will be Tuesday, April 23, 2019 at 5:00 p.m. Come and celebrate the official opening of this wonderful playground and to honor Ann. Overflow parking with shuttle service from Richardson High School.